Once you see the other pictures, you'll realize that we really didn't change too much in here. 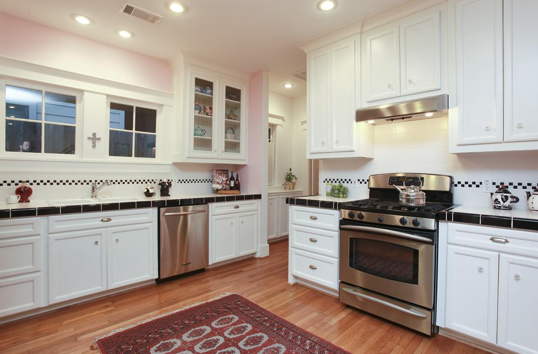 We loved the big, white cabinets from the beginning and were lucky to have quality appliances. Our goal all along was to change out the black and white tiled countertop and backsplash (a little too '50s and hard to clean) and repaint the pink walls. Trust me, this place was pink. It's a little hard to tell in the pictures, but we're talking newborn baby girl pink. First of all, we don't get much natural light in here; so I know the color looks a little crazy. 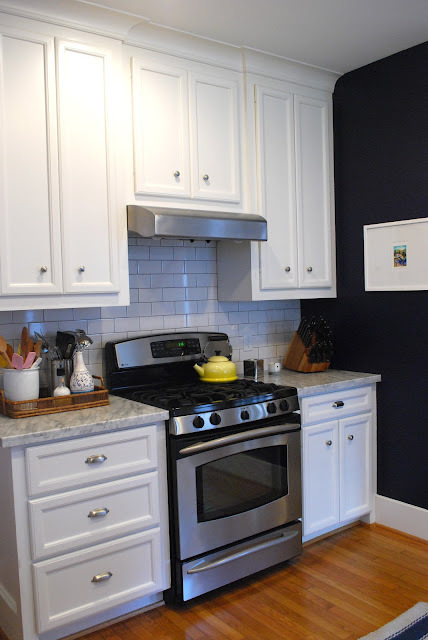 We updated the backsplash with subway tiles and dark grout and went with Carrara Marble countertops. We had really been thinking about a white granite but found out marble would cost us the same amount. Since we don't have that much counter space, we decided to go for it. I pretty much kissed them when they were laid down. Then, I changed up some of the knobs to make them more visible from the clear glass we had, and we painted the walls navy blue. We were set on white paint, but I woke up in the middle of the night one night convinced we needed a navy kitchen. We happened to have a sample of navy paint; so I painted a little square with the hopes of convincing Kyle. He was pretty hesitant but ended up loving it, and now he's convinced he needs a navy study. So there it is, the one place in the house I spend most of my time. (Mainly because the dog treats are in there). I just wish I had better photography skills and some natural light so the pictures didn't look so wonky! It looks beautiful! I love the contrast between the white and navy. I love it!!! I have to admit I was shocked at how great the before picture was (I didn't even notice the pink). Those cabinets are beautiful and I did notice and think the knob change was a good move. The counters and backsplash turned out gorgeous. I'd be excited if that were my kitchen. Congrats! I love it!! I have to admit, the before picture is so nice that I thought it was the final picture at first. I didn't even notice the pink walls. I did notice the change in the knobs (good move), and love how the counter and backsplash turned out. I'd be so excited if that were my new kitchen! Nicely done! Just amazing, love the navy! You had a great kitchen to begin with but now it is perfection. Love the marble. The navy is to-die-for and so much more interesting than white! Well done!